Rogier van der Weyden, embroidered pillows? 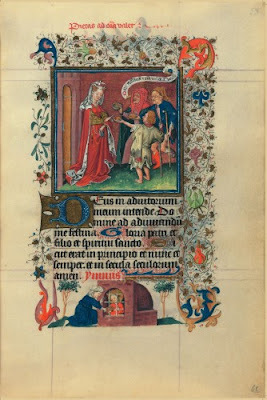 Museum Valkhof in Nijmegen (The Netherlands) presents an exhibition about Catherine of Cleves: Catherine’s world: devotion, demons and daily life in the 15th century. The miniatures are rich in detail, for example the one below in which Catherine gives money to the poor. It's difficult to discern in this picture, but close-ups of this folio show that she's got a beautiful blue and gold/yellow alms pouch with three tassels, also in blue and gold/yellow. It also seems to have to golden/yellow knops at the sides.